Announcement Handmade Modern Pottery for the Home. Each piece is thoughtfully designed and lovingly made by Katie M Mudd in Portland, Oregon. If you live in Portland Or, enter PDXLOCAL at check out and you're shipping is free- we can arrange for a pick up in either SE or NE. Handmade Modern Pottery for the Home. Each piece is thoughtfully designed and lovingly made by Katie M Mudd in Portland, Oregon. 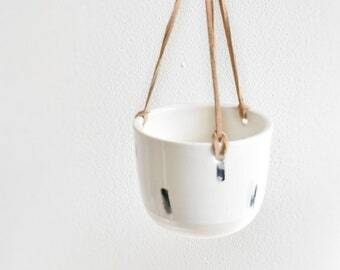 Airy Handmade Porcelain Hanging Planter in Matte White for 4"x4"
This hanging pot fits so well in our home. It feels solid and well made, and I love the matte white finish. Thanks Katie! This is my favorite mug! I wish I had more than one of them! So beautiful and simple. Restock of one of these cuties! So many Wabi Sabi cuties just added!! Yay!! Nothing leaves unless it is wrapped to perfection! On Wednesday we wear pink, and every other day too! It's a job requirement to come home covered in clay, that's how I know I'm doing my part and putting all of myself into my work. My name really is Mudd, I promise, it's just a wonderful and silly coincidence that I am also production potter. 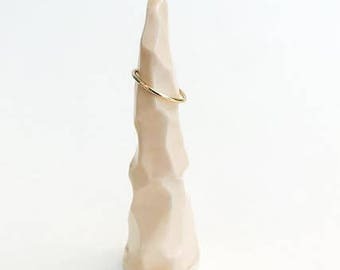 I am based in Portland Oregon, and I personally handcraft each piece using a variety of techniques. Much of my work is thrown on the wheel, but I also hand build certain objects. I love everything about clay, and getting to work with it all the time is hands downs, the absolute best! Sure, it's a messy medium and at times can be very physically demanding, but I wouldn't have it any other way. There is something so special and rewarding in knowing that through this crazy process I am making a piece that will eventually become part of somebody else's life, and somebody else's story. This is my goal, as an artist and as a maker; to create objects that are ready to take on a life of their own, and with the help of their owner, start a narrative that is unique them. 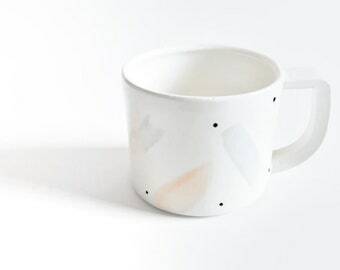 Portland based potter, Katie Mudd's love of crispy clean lines and appreciation of simple shapes inspire her minimal aesthetic. She is a strong believer in less is more, unless that more is being covered in clay. Griffon started at KMMC April of 2016 and has been a vital member of the team ever since. His duties include providing encouraging smooches and high fives. You will most often find him guarding the kilns, especially in the winter. If you find that your piece has broken during shipping please contact me within one week of having received the object with photos of the damage and I will happily replace your piece. If you are not satisfied with your purchase, please contact me within one week of having received it and we can work something out. Your satisfaction is very important to me. Purchases will only be shipped or produced once full payment is received. Items are typically shipped via a USPS flat rate shipper and will arrive within 2-3 of shipping. If you are uncertain if your purchase will fit please feel free to contact me. Pieces are both microwave and dishwasher safe. Please allow 30 days for custom order, pottery is a finicky medium and requires sufficient drying time to avoid breakage.